A perfect slice of banana bread can be one of the most satisfying and delightful simple pleasures your taste-buds will ever experience. Spread on a little soft butter and it goes to a whole new level. This recipe was passed down to me by my mom and it is the only one I have ever baked. I have tweaked it a little but it is essentially the same recipe I grew up with. Personally, I am kind of a purest when it comes to banana bread, with the possible exception of a few chopped walnuts or pecans. I don’t like cinnamon, chocolate chips or or anything else added to mine but that is obviously a personal choice and you could toss in whatever your heart desires to your own batch. Cream sugar and butter for 4 to 5 minutes on high speed, scraping sides half way through. Add mashed banana and beat to combine. Add soda/ water mixture and beat to combine. Add flour and salt and mix gently just to combine but don't over mix. I love the medium size pans that are disposable. I use cooking spray and fill each pan with approximately 10 ounces of batter, I usually get about 4 pans. Bake for approximately 40 minutes. If you use larger or smaller pans, the baking time will alter. The recipe says 3 bananas, which is very vague I know but I have never measured it in cups. If there is ever a question, I err on the side of more bananas. I use 3 medium to large bananas. If my bananas are small, I use 4. Usually I double or triple the recipe and just toss in an extra banana to be sure. I am going to share the tips I have discovered that will help you bake a perfect loaf of banana bread; one that is tender and delicious and has a depth of banana flavor that will make your mouth water just thinking about it. Here are my secrets. One of the hardest things about banana bread is that you want your bananas very ripe for the best outcome but if you wait one day too long you may have to throw them away because they actually crossed that line. But now you can roast them so they are ready when you need them. You can line a baking sheet with foil and roast your yellow bananas (still in their peels) in a 350 degree oven for 20 to 30 minutes. The peels will turn brown and that will indicate that they are ready. Although the reason I started doing this was for convenience of having bananas ready when I wanted them, I have come to believe that it may actually enhance the flavor just like roasting your nuts or oatmeal before cooking with it. I run mine through the food processor because I like them without any lumps. 3. Use a tried and true recipe. 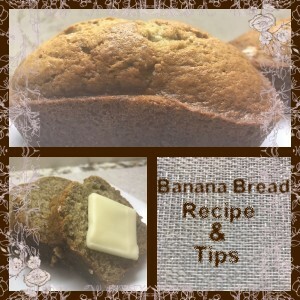 I have never tasted a piece of banana bread that I like as much as the one I grew up with. This recipe uses just ordinary ingredients that you most likely have in your kitchen but it just works. It calls for dissolving the baking soda in hot water which I love because since you gently mix the dry ingredients in it is easy to leave a chunk of soda that doesn’t dissolve. 4. Cream your butter and sugar for 4 to 5 minutes at high speed. And only use real butter. Cream the heck out of your butter (only use real butter) and sugar, let them go on high speed while you assemble your other ingredients. Stop during the middle once and scrape down the sides then continue beating for a total of 4 to 5 minutes. This is something I do in most of my recipes now and I feel it really does make a difference. Depending on how you measure, two cups of flour can differ greatly from one person to another or even one time to the next. Weighing your flour ensures that you get a consistent result every time. If you don’t have a scale just be sure to lightly spoon it into your measuring cup and then using a knife level off the top. Banana bread made in a regular size bread pan has to bake for 60 to 70 minutes which I often feel takes a toll on the sides and bottom of the loaf. They can get tough and a little over cooked in the time it takes to get the middle done. Also who wants to wait that long for your banana bread to bake. I have also made it in the mini personal sized loaves but I feel like they have too much bottom and side crust in comparison to the middle part. So the best size is the small loaf pans that come in the disposable pans . They bake up in about 40 minutes when filled with 10 ounces of batter and are just perfect! 7. Let the batter sit for at least a half an hour or refrigerate it for up to two or three days before baking. I could give you all sorts of scientific reasons for this but I don’t really know why, it seems that it works. For one thing, it gives the flour a chance to absorb the liquid. Also it is handy to be able to make the batter ahead of time and bake it when it is convenient.